Another under-the-radar classic from Guinand: A week on the wrist with the Model 361. Why you should know about Guinand. Regular readers may have seen my recent post about the outstanding (but limited!) Guinand A. Schild Flieger. If you haven’t yet read it, what you should know about Guinand is that they are the small German watchmaker for fans of tool watches Hergestellt in Deutschland. This is especially true if you appreciate mid-century German tool watch design but also value modern manufacturing precision and quality. The subject of our article today is the brilliant Model 361, Guinand’s new re-issue of their original 361, which was also manufactured for Helmut Sinn and sold as the Sinn 102. Bothered by dials with cut off numerals? I’m not, but the beautiful dial details of the Guinand Model 361 avoid it anyway. Note the lovely grooved registers. When Guinand announced the Model 361 in March, 2018, I was immediately smitten. In the same month, Hamilton announced that they’d come to their senses and were going to release the Intramatic chronograph with a panda dial in a 4o mm case, correcting what a lot of Hamilton fans saw as a critical misstep for the Intramatic 68 reverse panda LE, which was perfectly proportioned but big-all-over in its 42 mm case. As a disheartened lover of the Intramatic 68 LE, but a fan of Hamilton watches in general, I was immediately intrigued with the new 40 mm panda. Although I won’t rule it out some time down the road, when I tried it on at a Hamilton dealer in November, I didn’t feel an immediate connection, so I left it on the dealer’s counter. But the Guinand Model 361 continued to haunt my dreams. The Guinand Model 361. Note the vintage details such as the open 6, hooked 7, and simple, printed bezel. I stayed in touch with the very pleasant Petra Stegelmann at Guinand throughout the year, and finally the time was right to order my Model 361 in late November. My watch arrived on the Thursday of Christmas week, and I set it against my Junghans atomic clock at 12 noon. I then wore it 24/7 for a week, which included quite a bit of time making watch straps at the workbench, a little travel, a little skiing, a lot of sleeping, some hiking, lots of dog walking, occasional Scotch drinking, and all the usual stuff most folks do over their Christmas break. There is a lot going on with the Model 361, so I’ll spend a little more time describing its intricacies than I might in a normal week-on-the-wrist review. The watch is a 30-minute chronograph powered by a handsomely finished Valjoux 7753. Although you can specify the watch with a see-through caseback, I chose the solid caseback option. Typical of any Guinand watch, the movement is expertly assembled and meticulously adjusted in five positions, arriving at your doorstep an excellent timekeeper right out of the box. No modular movement here; the beautifully finished Valjoux 7753 ticking away inside the Model 361. Picture credit: guinand-uhren.de. The case is a rather perfect 40 mm across x 15 mm tall x 48 mm long. Admittedly, judging only from those numbers I was worried that this watch might be a bit chunky. But with it on my wrist I immediately knew that my fear was unfounded, as there is some magic built into this watch that makes it wear smaller than advertised, and rather perfectly on my 7-¼ inch wrist. Partly, I think, it’s the gracefully stout lugs, which angle purposefully down and put the strap bars toward the bottom plane of the case. The lug width is my favorite 20 mm, and strap clearance is ample. The pushers are protected by collars and the crown screws down several full turns, both protective measures no doubt contributing to the Model 361’s impressive 200 m water resistance rating. Clockwise from upper left: Christmas tree lights, the solid caseback, easy cuff fit, and collared pushers. There is another factor that I think adds to the Model 361’s wearability, which is the way the finishing touches of its dial, case, and bezel all interact with each other. The count-up bezel here is a matte-finished aluminum affair, friction fit to the case, with subtle crenellations that make it perfectly grippable. The edge of the slightly domed sapphire crystal sits just proud of the bezel’s inner surface and is finished with an opaque edge, blending seamlessly with the bezel’s inner boundary. But the real star of the show here has got to be the dial. Fans of technologically obsolete mechanical calculators will rejoice, because true to the original Model 361, the dial has both tachymeter and telemeter scales. Elapsed seconds shares space with the telemeter scale, making the outer edge of this dial a micro-printed tour de force. It’s pointless to criticize any watch for having these scales since wearing any wristwatch is itself an exercise in obsolescence. More so in the case of the Model 361, the whole point of which was to reissue a classic watch from Guinand’s legacy catalog; so if you think tachy/tele dials are silly, you should probably just stop reading now. The dial is beautifully finished, and has a deep enamel-like reflectivity to it. It’s fun to tilt the watch and see the luminescent paint precisely applied to the pre-printed numerals, which reminds me of a favorite vintage watch of mine, the Lemania Tg 195. Although the Guinand’s application is obviously much more modern and precise, the fact that the comparison suggests itself is prima facie evidence of just how carefully considered the vintage details of this Guinand really are. Fortunately for blog readers, the miracle of macrophotography reveals it perfectly, and the motivated investigator of this watch will not fail to notice such luscious details as the open 6 and hooked 7. 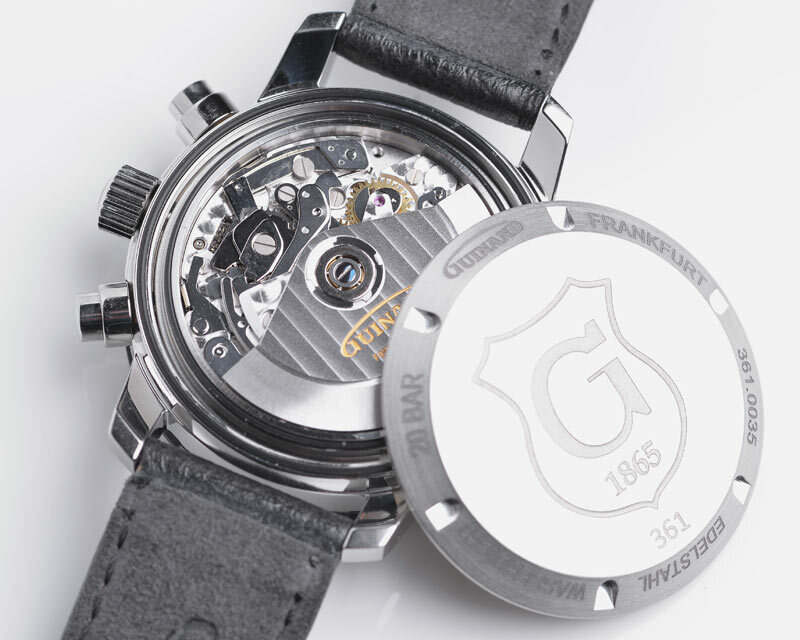 Luminescent dial details of the Lemania Tg 195 (L) and Guinand Model 361 (R). Perhaps the biggest but most subtle nod to the Model 361’s inspired design is the completely charming but totally obsolete 3-minute increments at 3, 6, and 9 minutes on the chronograph register. Authoritative sources on chronograph history are in disagreement as to the purpose of these 3-minute hash marks, so I’ll leave you to conduct your own research and form your own opinion. But just the fact that they are present on the Model 361 speaks to how carefully and faithfully Guinand sought to recreate this classic dial. Mid-century design zeitgeist, the Model 361’s minutes register includes 3-minute indices. The rest is icing on the cake. The concentrically grooved registers, the syringe hands, the superfluous information regarding stone count and antimagnetism, and the beautifully proportioned Guinand logo make for a perfect, and perfectly vintage, presentation. Having this watch on your wrist makes you want to get up, pour yourself another Johnnie Walker Black, and flip Kind of Blue over to side B, confident in the knowledge that should you be transported back to a pre-digital battlefield, you’d be well-equipped for your life as an artillery officer. Christmas was on Tuesday and the Guinand arrived on Thursday. So on Saturday we de-Christmas’ed the house; loaded up the Toyota with skis, dogs, food, and champagne; and set off for a northern New Year’s Eve adventure. Normally, I would pack an additional watch for a trip like this — one skiing/swimming/hiking watch and one dinner-eating/champagne-toasting watch. But happily, the Guinand 361 simplified my packing because it resides so comfortably in both camps, its robust construction paired with its classic styling. A day in the life of a watch, clockwise from upper left: walking to the Post Office to mail off some straps; a quick stop on the way out of town for some NYE essentials; arrival and relaxation; walking the dog at the foot of the mountain. And a couple of hours later we are unloaded and ensconced in the comforts of our northern home-away-from-home at Crystal Mountain, Michigan. Normally we could expect lots of snow, but our warmer winters recently mean it’s noticeably less snowy at this time of year. The luxury of not having to get up at 5:30 AM for work means I sleep in, and we actually see the sun on Juniper’s morning walk. There is a fresh dusting of snow and the palpably high spirits of all the holiday-makers in the ski village get us excited about the skiing to come. Yikes, it’s already 10 AM and I have to get moving. The first order of business is to put the Guinand on a nylon strap for over-the-sleeve ski watch use. It wears quite nicely on the two brands of NATO I try it on, and a few minutes later I’m ready to go. On the lightweight nylon strap, the Guinand blends in seamlessly under the cuff or is sturdily useful for keeping an eye on the time when worn over it. We spend the day skiing and dog walking until everyone is ready for either a nap or a glass of champagne, or both. A quick strap change transforms the Model 361 into a great #skiwatch. On our second full day at the resort, the outdoor temperature warms up and what started out as snow turns to rain. We make the best of it and enjoy a few runs until the rain gets obnoxious and we take it as a sign that we should return to our cottage and its warm fire, hot soup, and cold beer. The Model 361 is unperturbed by skiing in the rain. So far so good, but is it a One Watch watch? At this point I’ve owned this watch for all of four days and I start to have One Watch thoughts. So on New Year’s Eve Day, while sipping a pint of Bell’s Two Hearted Ale, the world’s best beer, I quickly score the watch against the Rover Haven One Watch criteria. Over the course of that pint of Two Hearted, the rain turns to snow and it feels like winter again. The watch and beer gods, smiling on us again. Reasonable size. For me this is about 40-42 mm, although I'm flexible since one number never tells a watch's whole story. The Guinand Model 361 is a perfect 40 mm in diameter with 20 mm lug width. It wears smaller than its full dimensions might suggest and earns full marks here. Good water resistance. A One Watch watch needs to have at least 100 m of water resistance. The Model 361 has a rated WR of 200 m, so it satisfies the “What? There’s a pool?” need that a good One Watch has. Full marks. Strap flexibility. Happily, the Model 361 has more than ample strap clearance and wears very nicely on Rover Haven Arts & Crafts straps, one-piece pull-thru shell cordovan straps, and nylon NATO straps. Full marks for the strap lover here. Better than average lume. The ability to read my watch upon waking up in the middle of the night is a key characteristic for me. The Model 361 has perfectly adequate lume and is quite easily readable 5-6 hours after a full charge. While it’s not the veritable torch that the AS Flieger’s dial is, it’s still worthy of full marks for lume. Strong legibility. I've had some really cool watches, but I've learned that if a watch isn't easily read at a glance, it just won't last with me. Although obviously a complicated dial, the time of day is easily read at a glance on the Model 361 due to the clear Arabic numerals and minute markers. Full marks for readability. Elapsed time. A good One Watch watch will have some means of quickly and easily measuring short intervals of time. For me, this is a count-up or count-down bezel, which the Model 361 has in addition to its 30-minute chronograph. Full marks again! Date. A good One Watch watch must have a date indicator to be considered for admission into the One Watch Club. I don't really care where it is, as long as it isn't Sore Thumb Ugly. Alas, the Model 361 has no date indicator on it, but I’m actually glad that it fails this criterion because any date on this watch would ruin it. Drilled lugs. No drilled lugs on the Model 361. Since so few watches have drilled lugs these days, this is bonus point territory only anyway. Six out of eight, a perfectly reasonable score and sufficient to award the Model 361 Rover Haven One Watch status. Open the Veuve Clicquot! Midnight arrives and we ring in the New Year with another bottle of champagne against the backdrop of the resort’s fireworks. In my family, we don’t need a special occasion to reflect on the important things in this life like family, love, integrity, and good fortune, but certainly the new year presents an obvious opportunity. A good watch, regardless of its pedigree, will help you mark these moments and make them more memorable. On this New Year’s Eve, I am glad to be with the people I am with and wearing my Guinand Model 361. Sunrise from the top of the lift at Crystal Mountain. Thank you for reading my blog. As always, I enjoy hearing from other enthusiasts and welcome your comments and factual corrections. The Sinn 104 White. A weekend on the wrist in northern Michigan with the 104 St Sa I W. Hello, One Watch Club?